Twelfth Night, or What You Will is a comedy by William Shakespeare, believed to have been written around 1601–1602 as a Twelfth Night's entertainment for the close of the Christmas season. The play centres on the twins Viola and Sebastian, who are separated in a shipwreck. Viola (who is disguised as Cesario) falls in love with Duke Orsino, who in turn is in love with the Countess Olivia. Upon meeting Viola, Countess Olivia falls in love with her thinking she is a man. The play expanded on the musical interludes and riotous disorder expected of the occasion, with plot elements drawn from the short story "Of Apollonius and Silla" by Barnabe Rich, based on a story by Matteo Bandello. The first recorded public performance was on 2 February 1602, at Candlemas, the formal end of Christmastide in the year's calendar. The play was not published until its inclusion in the 1623 First Folio. Viola - a shipwrecked young woman who disguises herself as "Cesario"
Viola is shipwrecked on the coast of Illyria and she comes ashore with the help of a Captain. She has lost contact with her twin brother, Sebastian, whom she believes to be drowned, and with the aid of the Captain, she disguises herself as a young man under the name Cesario, and enters the service of Duke Orsino. Duke Orsino has convinced himself that he is in love with Olivia, who is mourning the recent deaths of her father and brother. She refuses to see entertainments, be in the company of men, or accept love or marriage proposals from anyone, the Duke included, until seven years have passed. Duke Orsino then uses 'Cesario' as an intermediary to profess his passionate love before Olivia. Olivia, however, falls in love with 'Cesario', setting her at odds with her professed duty. In the meantime, Viola has fallen in love with the Duke Orsino, creating a love triangle: Viola loves Duke Orsino, Duke Orsino loves Olivia, and Olivia loves Viola disguised as Cesario. In the comic subplot, several characters conspire to make Olivia's pompous steward, Malvolio, believe that Olivia has fallen for him. This involves Olivia's riotous uncle, Sir Toby Belch; another would-be suitor, a silly squire named Sir Andrew Aguecheek; her servants Maria and Fabian; and her melancholy fool, Feste. 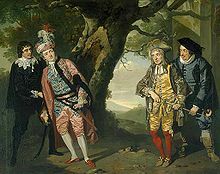 Sir Toby and Sir Andrew engage themselves in drinking and revelry, thus disturbing the peace of Olivia's household until late into the night, prompting Malvolio to chastise them. Sir Toby famously retorts, "Dost thou think, because thou art virtuous, there shall be no more cakes and ale?" (Act II, Scene III). Sir Toby, Sir Andrew, and Maria plan revenge on Malvolio. They convince Malvolio that Olivia is secretly in love with him by planting a love letter, written by Maria in Olivia's handwriting. It asks Malvolio to wear yellow stockings cross-gartered, to be rude to the rest of the servants, and to smile constantly in the presence of Olivia. Malvolio finds the letter and reacts in surprised delight. He starts acting out the contents of the letter to show Olivia his positive response. Olivia is shocked by the changes in Malvolio and agreeing that he seems mad, leaves him to be cared for by his tormentors. Pretending that Malvolio is insane, they lock him up in a dark chamber. Feste visits him to mock his insanity, both disguised as a priest and as himself. Meanwhile, Viola's twin, Sebastian, has been rescued by Antonio, a sea captain who previously fought against Orsino, yet who accompanies Sebastian to Illyria, despite the danger, because of his affection for Sebastian. Sebastian's appearance adds the confusion of mistaken identities to the comedy. Taking Sebastian for 'Cesario', Olivia asks him to marry her, and they are secretly married in a church. Finally, when 'Cesario' and Sebastian appear in the presence of both Olivia and Orsino, there is more wonder and confusion at their physical similarity. At this point, Viola reveals her identity and is reunited with her twin brother. The play ends in a declaration of marriage between Duke Orsino and Viola, and it is learned that Sir Toby has married Maria. Malvolio swears revenge on his tormentors and stalks off, but Orsino sends Fabian to placate him. Illyria, the exotic setting of Twelfth Night, is important to the play's romantic atmosphere. Illyria was an ancient region of the Western Balkans whose coast (the eastern coast of the Adriatic Sea which is the only part of ancient Illyria which is relevant to the play) covered (from north to south) the coasts of modern-day Slovenia, Croatia, Bosnia and Herzegovina, Montenegro, and Albania. It included the city-state of the Republic of Ragusa which has been proposed as the setting. Illyria may have been suggested by the Roman comedy Menaechmi, the plot of which also involves twins who are mistaken for each other. Illyria is also referred to as a site of pirates in Shakespeare's earlier play, Henry VI, Part 2. The names of most of the characters are Italian but some of the comic characters have English names. Oddly, the "Illyrian" lady Olivia has an English uncle, Sir Toby Belch. It has been noted that the play's setting also has other English allusions such as Viola's use of "Westward ho! ", a typical cry of 16th century London boatmen, and also Antonio's recommendation to Sebastian of "The Elephant" as where it is best to lodge in Illyria (The Elephant was a pub not far from the Globe Theatre). "Twelfth Night" is a reference to the twelfth night after Christmas Day, called the Eve of the Feast of Epiphany. It was originally a Catholic holiday and therefore, like other Christian feast days, an occasion for revelry. Servants often dressed up as their masters, men as women and so forth. This history of festive ritual and Carnivalesque reversal, based on the ancient Roman festival of Saturnalia at the same time of year (characterized by drunken revelry and inversion of the social order; masters became slaves for a day, and vice versa), is the cultural origin of the play's gender confusion-driven plot. The actual Elizabethan festival of Twelfth Night would involve the antics of a Lord of Misrule, who before leaving his temporary position of authority, would call for entertainment, songs and mummery; the play has been regarded as preserving this festive and traditional atmosphere of licensed disorder. This leads to the general inversion of the order of things, most notably gender roles. The embittered and isolated Malvolio can be regarded as an adversary of festive enjoyment and community, led by Sir Toby Belch, "the vice-regent spokesman for cakes and ale" and his partner in a comic stock duo, the simple and constantly exploited Sir Andrew Aguecheek. As the very nature of Twelfth Night explores gender identity and sexual attraction, having a male actor play Viola enhanced the impression of androgyny and sexual ambiguity. Some modern scholars believe that Twelfth Night, with the added confusion of male actors and Viola's deception, addresses gender issues "with particular immediacy". They also accept that the depiction of gender in Twelfth Night stems from the era's prevalent scientific theory that females are simply imperfect males. This belief explains the almost indistinguishable differences between the sexes reflected in the casting and characters of Twelfth Night. At Olivia's first meeting with "Cesario" (Viola) in I.V she asks her "Are you a comedian?" (an Elizabethan term for "actor"). 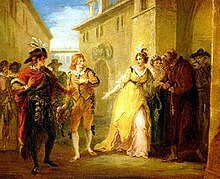 Viola's reply, "I am not that I play", epitomising her adoption of the role of "Cesario"(Viola), is regarded as one of several references to theatricality and "playing" within the play. The plot against Malvolio revolves around these ideas, and Fabian remarks in Act III, Scene iv: "If this were play'd upon a stage now, I could condemn it as an improbable fiction". In Act IV, Scene ii, Feste (The Fool) plays both parts in the "play" for Malvolio's benefit, alternating between adopting the voice of the local curate, Sir Topas, and his own voice. He finishes by likening himself to "the old Vice" of English Morality plays. Other influences of the English folk tradition can be seen in Feste's songs and dialogue, such as his final song in Act V. The last line of this song, "And we'll strive to please you every day", is a direct echo of similar lines from several English folk plays. When the play was first performed, all female parts were played by men or boys, but it has been the practice for some centuries now to cast women or girls in the female parts in all plays. The company of Shakespeare's Globe, London, has produced many notable, highly popular all-male performances, and a highlight of their 2002 season was Twelfth Night, with the Globe's artistic director Mark Rylance playing the part of Olivia. This season was preceded, in February, by a performance of the play by the same company at Middle Temple Hall, to celebrate the 400th anniversary of the play's première, at the same venue. The same production was revived in 2012–13 and transferred to sell-out runs in the West End and Broadway. Stephen Fry played Malvolio. It ran in repertory with Richard III. In March 2017, the Royal National Theatre's production of Twelfth Night  changed some of the roles from male to female, including Feste, Fabian (which became Fabia), and most notably, Malvolio – which became Malvolia – played by Tamsin Greig to largely positive reviews. As a result, the production played with sexuality as well as gender. In 2017/18, the Royal Shakespeare Company staged Twelfth Night, which was directed by Christopher Luscombe. Adrian Edmondson played Malvolio and Kara Tointon played Olivia. The 2001 Disney Channel Original Movie Motocrossed sets the story in the world of motocross racing. The 2006 film She's the Man modernises the story as a contemporary teenage comedy (as 10 Things I Hate About You did with The Taming of the Shrew). It is set in a prep school named Illyria and incorporates the names of the play's major characters. For example, Orsino, Duke of Illyria becomes simply Duke Orsino ("Duke" being his forename). The story was changed to revolve around the idea of soccer rivalry but the twisted character romance remained the same as the original. Viola, the main character, pretends to be her brother Sebastian, and a girl named Olivia falls in love with Viola as Sebastian. She also goes to a restaurant named "Cesario's". Two of Duke's Illyria soccer teammates are named Andrew and Toby. A nod is given to the omitted subplot by naming a briefly-onscreen tarantula Malvolio. Sebastian’s ex-girlfriend Monique was given the surname Valentine, and the meddling Malcolm was given the surname Festes. Shakespeare in Love contains several references to Twelfth Night. Near the end of the movie, Elizabeth I (Judi Dench) asks Shakespeare (Joseph Fiennes) to write a comedy for the Twelfth Night holiday. Shakespeare's love interest in the film, "Viola" (Gwyneth Paltrow), is the daughter of a wealthy merchant who disguises herself as a boy to become an actor; while Shakespeare, a financially struggling playwright suffering from writer's block, is trying to write Romeo and Juliet. 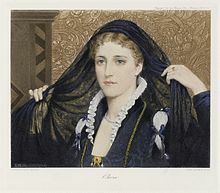 She is presented in the final scene of the film as William Shakespeare's "true" inspiration for the heroine of Twelfth Night. In a nod to the shipwrecked opening of Shakespeare's Twelfth Night, the movie includes a scene where the character Viola, separated from her love by an arranged marriage and bound for the American colonies, survives a shipwreck and comes ashore to Virginia. In 1943, Erich Korngold set the songs "Come Away, Death" (Act II, Scene 4), "O Mistress Mine" (Act II, Scene 3), "Adieu, Good Man Devil" (Act IV, Scene 2), "Hey, Robin" (Act IV, Scene 2), and "For the Rain, It Raineth Every Day" (Act V, Scene 1) as a song cycle entitled Narrenlieder, Op. 29. Roger Quilter set "O Mistress Mine" and "Come Away, Come Away, Death" in his Three Shakespeare Songs, Op. 6. Swedish composer Sven-Eric Johanson's song cycle for mixed chorus and piano "Fancies I" includes a setting in waltz time of "O Mistress Mine" (1974). British composer Peter Racine Fricker set "O Mistress Mine" in 1961. "O Mistress Mine" set by Peter Warlock (Phillip Heseltine), 1924. The Danish philosopher Søren Kierkegaard opens his 1844 book Philosophical Fragments with the quote "Better well hanged than ill wed" which is a paraphrase of Feste's comment to Maria in Act 1, Scene 5: "Many a good hanging prevents a bad marriage". Nietzsche also refers passingly to Twelfth Night (specifically, to Sir Andrew Aguecheek's suspicion, expressed in Act 1, Scene 3, that his excessive intake of beef is having an inverse effect on his wit) in the third essay of his Genealogy of Morality. The Kiddy Grade characters Viola and Cesario are named for Viola and her alter ego Cesario. ^ Thomson, Peter (1983). Shakespeare's Theatre. London: Routledge & Kegan Paul. p. 94. ISBN 0710094809. OCLC 9154553. 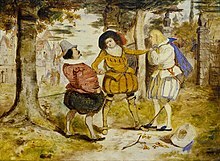 Shakespeare, having tackled the theatrical problems of providing Twelfth Night with effective musical interludes, found his attitude toward his material changed. An episodic story became in his mind a thing of dreams and themes. ^ Torbarina, Josip (June 1964). "The Settings of Shakespeare's Plays". Studia Romanica et Anglica Zagrabiensia (17–18): 21–59. ISSN 0039-3339. OCLC 760940009. ^ Shakespeare, William (2004). Donno, Elizabeth Story (ed.). Twelfth night, or, What you will (Updated ed.). Cambridge: Cambridge University Press. p. 7. ISBN 9780521827928. OCLC 54824521. ^ Laroque, François. Shakespeare's Festive World: Elizabethan Seasonal Entertainment and the Professional Stage. Cambridge University Press, 1991, p. 153. ^ Hobgood, Allison P. (Fall 2006). "Twelfth Night's "Notorious Abuse" of Malvolio: Shame, Humorality, and Early Modern Spectatorship" (PDF). Shakespeare Bulletin. Retrieved 17 November 2012. ^ a b Charles, Casey. "Gender Trouble in Twelfth Night". Theatre Journal. Vol. 49, No. 2 (1997): 121-141, p. 124. ^ Smith, Bruce R. "Introduction". Twelfth Night. Boston: Bedford/St. Martin's, 2001. ^ Gay, Penny: pp. 18–20. ^ Costa, Maddy (20 October 2009). "Malvolio – the killjoy the stars love to play". The Guardian. Retrieved 17 November 2012. ^ Costa, Maddy (1 October 2012). "Stephen Fry's Twelfth Night: this all-male affair is no one-man show". The Guardian. Retrieved 2 July 2012. ^ "Twelfth Night - National Theatre". www.nationaltheatre.org.uk. ^ Clapp, Susannah (26 February 2017). "Twelfth Night review – on high gender alert with Tamsin Greig" – via The Guardian. ^ Billington, Michael (23 February 2017). "Twelfth Night review – Tamsin Greig is brilliant in a show full of fun" – via The Guardian. ^ "Twelfth Night, National's Olivier Theatre review: Tamsin Greig shines in a production otherwise at sea". ^ "Twelfth Night theatre review: Tamsin Greig brings dazzling comic brio to a gender-bending production ★★★★★". ^ "About the play - Twelfth Night". Royal Shakespeare Company. ^ Examined, for example, in Jami Ake, "Glimpsing a 'Lesbian' Poetics in Twelfth Night", SEL: Studies in English Literature 1500–1900, 43.2, Tudor and Stuart Drama (Spring 2003) pp 375–94. ^ "Epiphany (Star, 1999) Epiphany (Bow Shakespeare Series #8)". takarazuka-revue.info. Archived from the original on 3 December 2010. Retrieved 11 December 2010. ^ "Twelfth Night: Or What You Will (1996)". Foster on Film. Retrieved 11 December 2010.